We study a wide range of topics including 'Myths and Legends' we will be looking at a number of different Myths from all over the world including some from Ancient Greece. 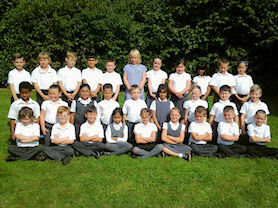 In Science we will be learning about Rocks and Soils and where they come from. During Numeracy lessons we will be learning how to use different units of measure, as well as how to put information we have found out into pictograms. 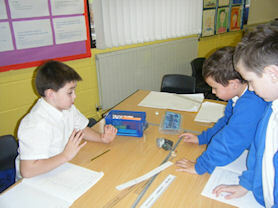 We are also practising our times tables of course! We are lucky enough to have use of the ICT facilities during some of our Literacy and Numeracy lessons as well as learning how to use databases and send emails. 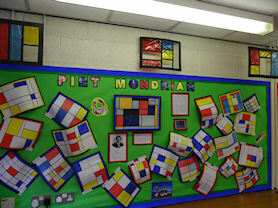 Artwork inspired by Piet Mondrian. 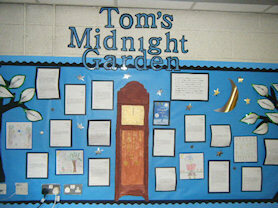 A literacy display on Tom's Midnight Garden. 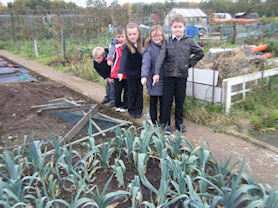 Look what we have been growing at the allotment! 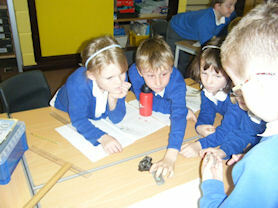 Looking at rocks in our Science lesson. How many different ways can we group the rocks? 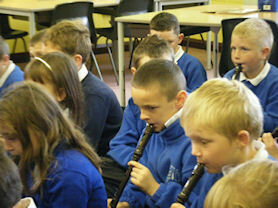 Concentrating rather hard in our recorder lesson!